A new liquid metal electrode (LME) battery made with a solid electrolyte and molten electrodes has been developed by researchers working on rechargeable batteries. Rather than a graphite electrode with lithium metal ions moving in and out, as in lithium-ion batteries, LMEs comprise liquid metal, and can boost the energy density of a cell by around 50%. They are comparatively inexpensive and have a long lifespan. But most LME batteries use molten salts as the electrolyte between the two electrodes, requiring a high operating temperature of 450°C. This presents stability challenges. Now, a team led by Yi Cui at Stanford University in the US have developed a solid electrolyte with a garnet-like structure, comprising a framework of lanthanum oxide and zirconium oxide that allows lithium ions to quickly zip through. One advantage of this LLZTO (Li6.4 La3 Zr1.4 Ta 0.6 O12) solid electrolyte tube is that it allowed the prototype battery to operate at 240°C, a much lower temperature than previous iterations. 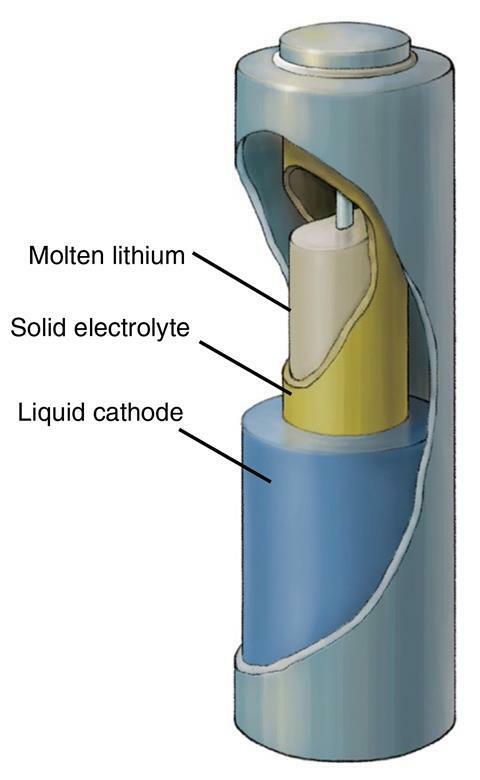 The solid electrolyte is wrapped around a liquid lithium metal anode, with a liquid cathode of either tin or bismuth alloy with lead then surrounding the electrolyte and anode. To test its durability over time, the researchers immersed their LLZTO tube in molten lithium at 300°C for two months. They reported no lithium penetration and no morphology change, and excellent chemical and mechanical stability of the ceramic tubes at high temperatures. ‘If you get the temperature down, it will reduce wear and tear on the components, so this is desirable,’ says Donald Sadoway, a materials chemist at Massachusetts Institute of Technology in the US. He recently reported on a liquid metal battery, but with a liquid electrolyte. Battery chemist Liangbing Hu at the University of Maryland, US, notes that the new liquid metal battery can be cycled at ‘a high current density,’ with temperatures ‘much lower than what was developed in the past 50 to 60 years’ for liquid metal batteries. He adds that ‘the next major step for commercialisation is to scale up the manufacturing at a low cost, given that they use relatively high-cost garnet-based lithium ion conductors’.